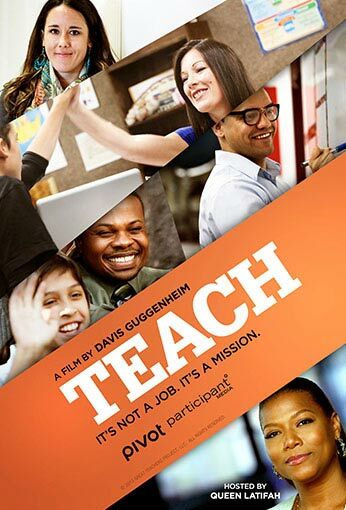 TEACH, Oscar-winning filmmaker Davis Guggenheim’s third documentary on the subject of education in America, asks the question, “What does it take to be a teacher?” Hosted and narrated by Oscar-nominee Queen Latifah, TEACH offers a rare glimpse inside four public school classrooms in different cities around the country. This year-in-the-life of four public school teachers will give an intense and emotional illustration of how tenacity, innovation and passion drives these educators as they navigate the ups and downs of the 2012-13 school year. Viewers will go into the public school district classrooms of: Matt Johnson, a 4th grade teacher at McGlone Elementary, Denver; Shelby Harris, 7th and 8th grade math teacher at Kuna Middle, Kuna, Idaho; Joel Laguna, a 10th grade AP World History teacher at Garfield High, Los Angeles; and Lindsay Chinn, a 9th grade algebra teacher at MLK Early College, Denver. These educators mentor their students to help them overcome obstacles and strive for success. While they all aspire to be the best at their jobs, Guggenheim’s subjects are diverse in every way, implementing conventional and unconventional methods, and teaching different subjects and age groups in a range of communities. Yet, they all have one common denominator – the grit and resolve to hang in and make a difference with their students.